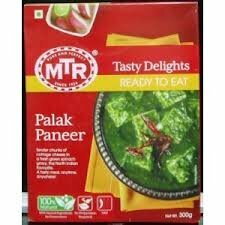 Taste the combined benefits of convenience, health and variety - only with MTR Foods' Ready-To-Eat range. Our range of products cover wide range of delicious North Indian and South Indian recipes, to give you a taste of food which taste just like fresh home cooked food. It is your ready help in kitchen for authentic taste, variety of choices in different Indian cuisines and high on convenience. Our range currently comprises of Soups, Vegetable curries, Paneer gravies and various rice items. Each item on our Ready-To-Eat menu is natural, preservative-free and 100% vegetarian. Our technology also ensures that each item delivers that 'just-cooked' freshness straight on your plate!